Carey Hamilton, 49, of Methuen, was charged Tuesday with mayhem and assault and battery with a dangerous weapon in connection with Saturday night's brawl at the Brickhouse Tavern + Tap. New details about a brutal fight at a Methuen, Massachusetts bar last weekend emerged in court documents released Wednesday. Carey Hamilton, 49, of Methuen, was the first person arrested in connection with Saturday night's brawl at the Brickhouse Tavern + Tap. He was charged Tuesday with mayhem and assault and battery with a dangerous weapon. 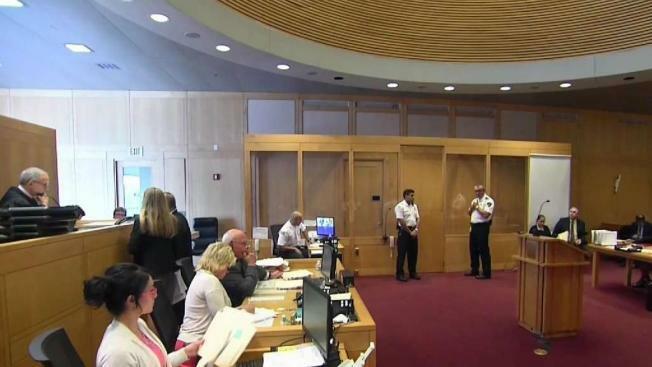 Hamilton refused to show his face at his arraignment on Wednesday. He is out on his own personal recognizance until his next court date later this month. Video of the fight shows shattered glass flying everywhere, with a man on the ground after taking what police said was a ceramic plate to the head. Someone in a Red Sox jersey then heaves a chair and throws a flurry of wild punches. A woman can be heard screaming in the background. 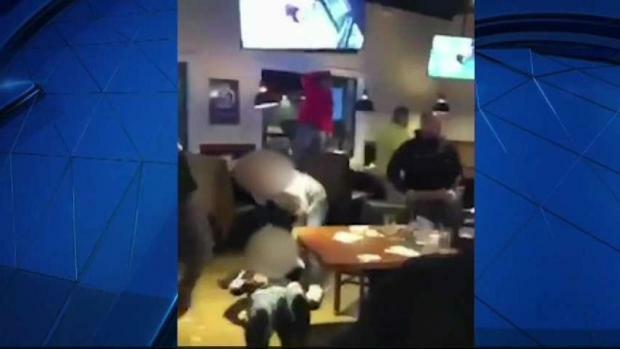 A fight broke out at a Methuen, Massachusetts bar early October 7 following the televised UFC Championship bout. Part of the violent melee was captured on cellphone video. The bar was packed for an Ultimate Fighting Championship match on television. 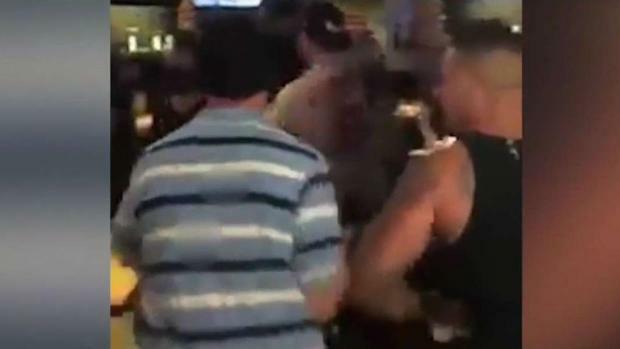 Police have not said what might have triggered the brawl, but eyewitness Gerald Robito says it specifically had to do with some people at the restaurant insulting each other about who would win the match on TV. A 33-year-old Lowell man was treated at a local hospital and released. Court documents said a man since identified as Hamilton was identified by witnesses as the person who hit the man in the head and face with a glass or ceramic plate. One anonymous tipster said she was "100% sure" it was him. Charges Filed as Result of Bar Fight in Methuen, Mass. A witness who knows Hamilton but was at the bar with another group said a man got up at one point and began to show his middle fingers to the crowd. The witness said he attempted to hold back the man in an attempt to calm him down, and just as he released him, the man was "sucker punched" by an unknown man. "Several other fights then erupted at this time," the police report said. The man who was hit with the plate said the injuries he sustained included a lacerated eyebrow that required 20 stitches, a lacerated lip and cheek requiring 10 stitches, and two broken teeth. He also had to have a metal plate put into his mouth. Police in Methuen are asking for help in identifying the people involved in the huge bar fight that sent at least one person to the hospital over the weekend. Another witness said the man who was hit was trying to break up the fight. The next thing she remembers was seeing him walking over to her "with blood all over his face." The manager who was working at the bar on the night of the fight called what happened "gross." He told police there was some sort of an issue between an unknown intoxicated man and another group of guys. He said he was thrown to the ground during the fight and didn't witness the alleged assault. The investigation into the fight is ongoing, and police said additional charges are expected to be filed. "Now the secondary focus is going ot be a subject who threw a chair," Methuen Police Captain Jim Jajuga said. In the meantime, the restaurant manager says they will be adding security the next time they show a UFC event on TV.